As folks in Europe and US gear up for summer, here in southern part of India, I am enjoying the cooling effect of pre-monsoon showers. Don’t get me wrong, I love summer in India. The delicious variety of fruits(mangoes, jackfruits, grapes, watermelons, lychees, guavas, casaba melons, cantaloupes), fresh fruit juices, ice-creams and milkshakes; the visits to the pool and the dips in streams on treks, the longer drives to the cooler hill stations and the sunnier beaches; the walks in T-shirts, shorts and flip-flops under endless blue skies, what’s not to love! I almost don’t want summer to end! Yet, the monsoons are awaited here restlessly as summer passes by slowly, for the rain clouds bring breezes that soothe. 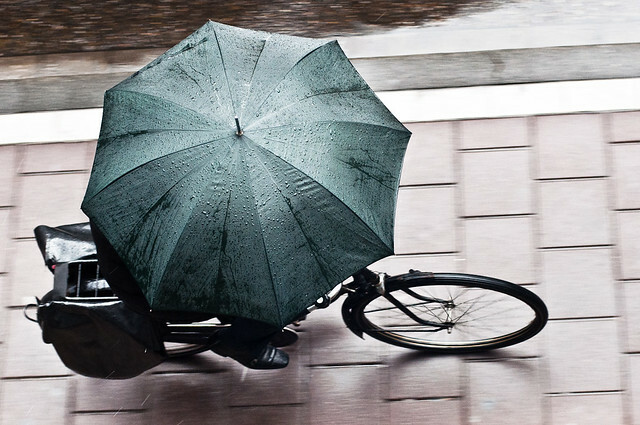 And as we cycle along into the rains, that earthy aroma that rises up into the air as the first drops of water hit dry earth is pure and magical. The monsoons rejuvenate parched forests, paddy fields, sugar cane farms, fruit orchards and tea, coffee and spice plantations and turn dry, monochromatic terrain into a vivid, lush, dense landscape full of vitality and life. The ponds, backwaters, rivers and waterfalls surge and roar through the jungles, where old makes way for new. Some of the animals and birds take cover in their nests, while others shake the water off their fur, dance and dive right into the thick of it all, relishing the sheer joy of the monsoons. We can soon head out on longer bike rides and just cycle without worrying about the heat draining us. The joy of riding along roads that have been hastily abandoned by motorists hiding from the rain is unmatched. The rivers that feed the waterfalls are at their best during the monsoons and you will get to play tag with the sun, the clouds, rain, fog and mist play as you cycle through the heart of India when most other people stay indoors. The operators that support your journey along the route have fewer customers to deal with, giving you a much better opportunity to actually get to know the locals and their way of life. Along the coastline, the seas wash away all the trappings of seasons past and leaving behind only a few people as you cycle along endless ribbons of beaches. Higher up in the mountains, the mountain passes are finally open again and the crisp blue skies, snowcapped mountains and alpine lakes beg us to explore the expansive vistas in the Indian Himalayas at leisure. The innumerable shades of green in the forested mountains, fields and farms that stretch around you, will nourish not just your eyes, but also your mind and your soul. If you are wondering where you can experience some of this monsoon magic, then take a look at the cycle tours we offer in Kerala, Ladakh and Sikkim, come rain or shine.